Susan M. Morris Sedgwick, age 50, passed away at her Millcreek Twp. home on Thursday, May 12, 2005, of breast cancer. Born in Erie on September 15, 1954, the daughter of Patricia and John Morris of Erie. She was a 1972 graduate of McDowell High School and a 1976 graduate of Indiana University of Pa., with a BS degree in Elementary Education. She had been employed at South Hills Child Development Center as a teacher, then as the Assistant Director for 29 years. Sue enjoyed all aspects of life, especially outdoor activities, including biking, hiking, windsurfing, golf, kite flying, kite skiing, and spending time at Presque Isle. She also loved to travel and particularly enjoyed creating stained glass pieces. Her first husband, Mark Taft, preceded Susan in death in 1981. Besides her parents, Susan is survived by her husband and best friend, Lee C. Sedgwick, whom she married on October 4, 1997. Sue’s memorial service was held recently, which she had planned down to the most minute detail and her instructions were followed exactly. The funeral home was decorated with banners, kites, pieces of stained glass, and pictures from the kids at her school. Her yoga teacher spoke as did a number of friends and family. Gathering at the house afterwards, those present told story after story… Drinking all her beer, enjoying each other’s company (as she had also specified in one of the many lists she left behind). The wind was blowing, the sun was out, a beautiful day… It was a very fitting celebration of her life. Well, the jitters went right out the window. I wasn’t really ‘anyone important,’ but Sue made you feel that way! Sue had a smile and a way of saying things that made you feel at ease and comfortable. Lee Sedgwick came up and introduced himself and we all talked for a while. I liked these two kite fliers right away! They were my kind of people. I kidded them about being ‘Coal Miners from Pennsylvania.’ It was the start of more then twenty years of a very enjoyable friendship with Lee and Sue. And it was also the beginning of many lessons about life that I learned from Sue, even though some times I didn’t realize she was teaching them. It was just the way Sue was! 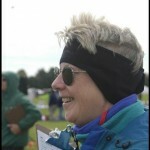 Sue earned her first stunt kite competition trophy at that Chicago event, the first of many trophies, awards, and honors! 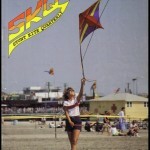 I was on the same kite field with Sue when she collected another important trophy. It was at the 1988 AKA Convention in Chicago. I was standing in the pit just before Open (Masters) Class Precision, awaiting my turn to fly. I again had the jitters. Sue was flying right after me in the flight order and she walked up to me and said, “Are you nervous?’ and I said, ‘I sure am, are you?’ Sue replied, ‘Of course I am!’ I was a little confused by this statement as Sue was an excellent flier, and ranked pretty high! I asked why she should be nervous? Sue looked at me very seriously and said, ‘Because I have to fly against you!’ It was so blatantly silly that I burst out laughing! Sue had helped me to get rid of those pre-flight jitters and I flew better than I ever had (or have since). She helped me to enjoy myself and I flew better because of it. It was Sue’s way of doing things! At that 1988 AKA Grand Nationals competition Sue took first place in Precision and became the first women to earn the title, ‘National Champion.’ None of the fliers (mostly guys) in the event mentioned that a women had beaten them, but we all did know that a competitor that was better than we were had won fairly and with more skill than all fourteen other fliers combined! Sue once said, ‘Kite competitions aren’t about gender. They’re about skill and flying ability,’ and she always worked to excel as a flier, and a person. Not that you could mistake Sue for anything but the beautiful lady that she was. She just didn’t feel that it was important whether you were a man or a woman, but it was important that you were a good kite flier and a good person. Sue was once approached by a promoter in Wildwood NJ with the idea of forming an all women kite team. The promoter wanted Sue and the team to fly pink Trlby’s and wear pink uniforms. Sue refused simply because it promoted a ‘Women Only’ attitude she didn’t believe in. This isn’t saying that Sue wanted to be… ‘ just one of the guys…’. Far from it! Sue simply believed in herself and who she was! It was Sue’s way! Sue eventually moved from the competitors side of the competition field and began to judge. 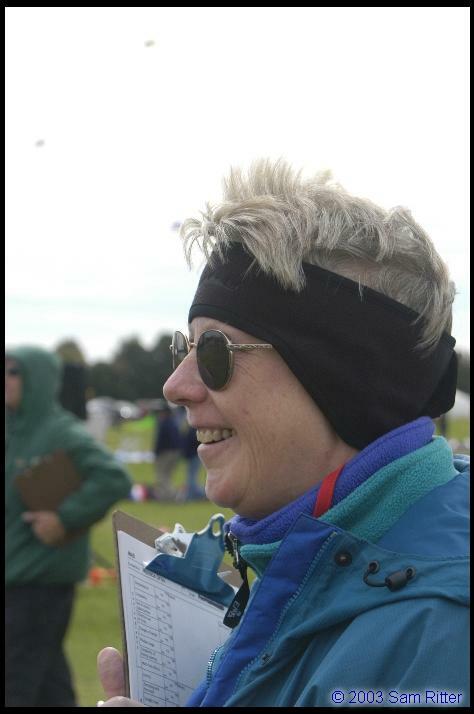 She was very involved for many years with the AKA Sport Kite Committee and spent a large amount of her time at kite events, judging and volunteering. She helped to formulate many of the rules and procedures we all fly to out on the comp fields today! Sue was a ‘tough’ judge and you had to fly really well to earn a good score from her. But when Sue was off the field she became something quite different from the ‘tough judge’. No matter how poorly you flew in a competition, when you asked Sue afterwards what she thought of your routine, she would comment on all the good parts and never mention the errors and mistakes that might have earned you that last place you got. You would get encouragement, and praise for all that you did do right out on those flying fields. A ‘Pat on the back’ was what you usually got from Sue! I recall more than one flier dragging their feet off of a field after a dismal performance. They would walk past Sue and she would talk to them for a while and that depressed flier would come away smiling. I’m not sure how she did it, but she encouraged you to believe in yourself and to enjoy yourself. I know that a lot of you reading this have been taught that same lesson by Sue Sedgwick. From that time in 1988 when Sue encouraged me to fly better in that competition, I’ve tried to follow her example and what she taught me about believing in myself, about enjoying what I was doing, and to pass along that attitude! I always volunteer to Field Direct for the novice events at all the sport kite competitions I attend now. To help and encourage those that need it. To pass along that lesson Sue Sedgwick taught me! To continue the lessons Sue taught me! Over the weeks since Sue Sedgwick’s passing, I have heard many, many comments from hundreds of people who relate similar stories like these I’ve told about Sue! Stories about how she helped, encouraged, and supported others selflessly. I’ve heard many comments about the countless hours she volunteered to work for all of you while you competed. Sue was called an Innovator in kite flying, an excellent kite maker, a tireless supporter. Many of you commented about a lady who in these last several years worked harder than many of you, sometimes at great cost to her own personal health! She ignored her own personal pain and suffering simply to help us do what we wanted to do! She saw what needed to be done, and did it! 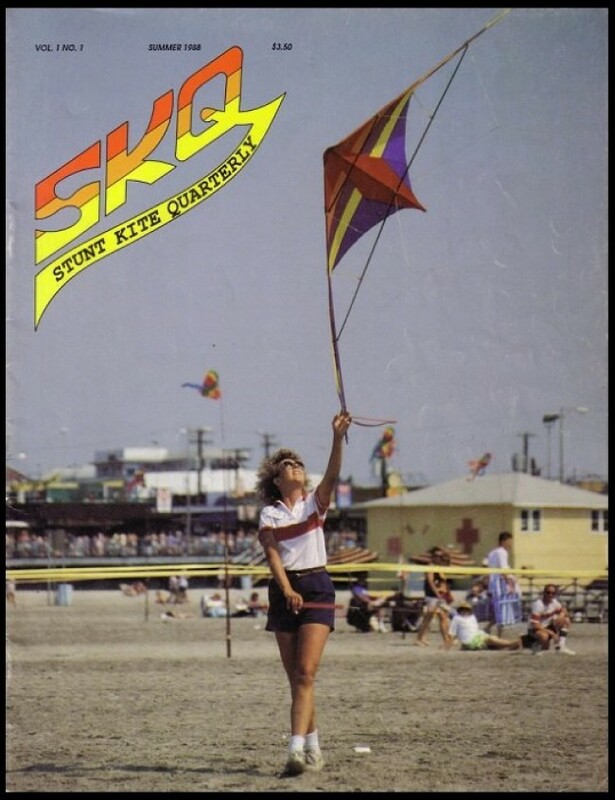 Sue didn’t really care about trophies, accolades, or awards although in her career as a kite flier she collected hundreds. What Sue Sedgwick really did care about was US – each and everyone of us! Sue cared about all of us as kite fliers, and people! Maybe Sue was the way she was because she spent twenty-nine years working with children at a Child Development Center in Erie, PA. Maybe it was just the kind of person Sue was? I know that in the coming months many people will search for ways to honor Sue Sedgwick! In the last twenty-some years I’ve had the honor of being Sue’s friend. She taught me an awfully lot. She helped me to learn a lot about myself. She helped many many of us in the same way over the years! I cannot think of a better celebration of someone’s life than to say that you are a better person simply because Sue Sedgwick was your friend! This entry was posted in 2005, Issue 42 (May/Jun), KL Archive and tagged empty spaces, people, sue sedgewick. Issue 42: Good Stuff: A documentary!